Based on NVIDIA's CUDA™ architecture, the NVIDIA accelerators enable seamless integration of GPU computing with HPE ProLiant servers for high-performance computing, large data center graphics and virtual desktop deployments. These accelerators deliver all of the standard benefits of GPU computing while enabling maximum reliability and tight integration with system monitoring and management tools such as HPE Insight Cluster Management Utility. The NVIDIA Tesla GPUs are general purpose accelerators which excel at boosting performance of structured numerical algorithms. These GPUs are powered by CUDA® and include technologies like Dynamic Parallelism and Hyper-Q to boost performance as well as power efficiency. Applications which benefit from accelerators include deep learning, seismic processing, biochemistry simulations, weather and climate modeling, image, video and signal processing, computational finance, computational physics, CAE, CFD, and data analytics. 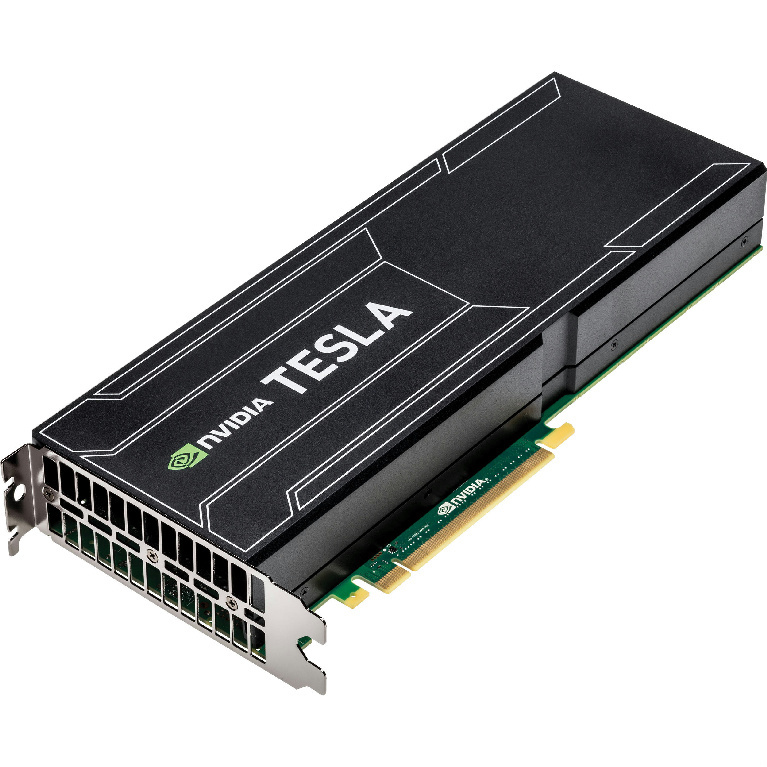 The NVIDIA Tesla K40 optimized for both double-precision algorithms, with 12 GB onboard memory. • The NVIDIA Parallel DataCache™ accelerates algorithms such as physics solvers, ray-tracing, and sparse matrix multiplication where data addresses are not known beforehand. This includes a configurable L1 cache per Streaming Multiprocessor block and a unified L2 cache for all of the processor cores. • Asynchronous transfer turbo charges system performance by transferring data over the PCIe bus while the computing cores are crunching other data. Even applications with heavy data-transfer requirements, such as seismic processing, can maximize the computing efficiency by transferring data to local memory before it is needed. • Dynamic Parallelism capability that enables GPU threads to automatically spawn new threads. • Hyper-Q feature that enables multiple CPU cores to simultaneously utilize the CUDA cores on a single GPU. • The high speed PCIe Gen 3.0 data transfer maximizes bandwidth between the HPE ProLiant server and the Tesla processors. The NVIDIA Accelerators for HPE ProLiant Servers improve computational performance, dramatically reducing the completion time for parallel tasks, offering quicker time to solutions. Co-locating the NVIDIA Quadro® or NVIDIA GRID GPUs with computational servers, large datasets can be shared, dramatically improving display refresh-rates. These GPUs are specifically designed to enable rich graphics in virtualized environments. Hewlett Packard Enterprise can satisfy NVIDIA GRID software via HPE Software Licensing and Management Service. Configured and monitored by HPE Insight Cluster Management Utility (CMU). HPE Insight CMU monitors and displays GPU health and temperature, and will also install and provision the GPU drivers and CUDA software. USED-WORKING-PULLS. Great Working Condition. Warranty 30 Days.